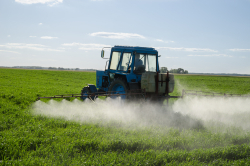 Here’s some good news for conventional and organic farmers alike: Researchers at the University of Florida College of Pharmacy have discovered a way to cost-effectively produce the bioherbicide thaxtomins. This means organic farmers can use the natural chemicals to ward off weeds and conventional farmers can use them on weeds that grow resistant to traditional, synthetic herbicides. Thaxtomins are phytotoxins that are potent in small quantities, but they are no new discovery. Rosemary Loria, Ph.D., a professor and chair of plant pathology in UF’s Institute of Food and Agricultural Sciences, has studied them throughout her career. More recently, she collaborated with Yousong Ding, Ph.D., an assistant professor of medicinal chemistry in the UF College of Pharmacy, part of UF Health, to discover a way to harvest thaxtomins more efficiently. The phytotoxin is found in nature in the form of potato scabs, a common disease that forms circular lesions on a potato’s surface. The disease causes a 4 percent loss in the potato industry’s value. It’s potato farmers’ bane, but it’s key to producing environmentally friendly weed killer for rice, wheat and cotton farmers. The thaxtomins found in potato scabs are produced by a pathogenic, or disease-causing, strain of Streptomyces. In the lab, this strain does not produce a sufficient amount of thaxtomins to be cost-effective. Ding successfully transferred the cluster of genes responsible for biosynthesis of thaxtomins into a nonpathogenic-Streptomyces strain, which allows greater control over production as well as a greater yield. Ding’s lab has succeeded in producing 20 times the amount of thaxtomins than the previous model: .2 grams per liter of Streptomyces culture versus .01 grams per liter. Synthetic herbicides affect more than just weeds. Irrigation can send the chemicals downstream, where they are toxic to aquatic plant and animal life. They also can get into the body and affect human development. “Through this study, we really wanted to produce a cost-effective, environmentally friendly herbicide that can be used not only by organic farmers, but that everyone can use,” Ding said. Thaxtomins as a bioherbicide are preferable over synthetic chemicals because they’re highly potent in small amounts and nature already has a way of disposing them, Ding said. UF researchers are in the process of licensing the new production method so it can be used commercially.